A question people often ask me about my trading posts is, “What is RYZE.Ai?” The simplest explanation is that RYZE.Ai from Hodo Global is a software program that utilizes an Artificial Intelligence algorithm and executes currency trades using a number of different trading strategies. To explain it differently, RYZE.Ai analyzes the Forex or currency markets and executes currency trades in order to generate profits. This provides Hodo Global members with brokerage accounts who subscribe to RYZE.Ai the chance to participate in the profits generated proportional to their account size..
Who can trade with RYZE.Ai? The RYZE.Ai software algorithm is available for use to HODO Global Partners who have subscribed to the program. RYZE.Ai is a subscription based software algorithm for the Hodo Global Partners to use to trade currencies in their own individual brokerage accounts. Each individual has complete control of their own brokerage account and their funds. While each person has RYZE.Ai activated it will conduct trades in their brokerage account. The size of each trade is proportional to the size of each individuals brokerage account. For example, if RYZE.Ai executes a currency or commodity (mainly gold or silver) trade a person with a $4,000 account will earn profits two times the size of a person with a $2,000 account. Proportionality keeps the trade risk of each trade proportional regardless of each persons account size. How to make money with RYZE.Ai? Absolutely, you absolutely can make profits with RYZE.Ai and trading currencies or commodities. Note that while past performance is not a guarantee of future results, RYZE.Ai has performed wonderfully up to this point in time but results in the future may change. In today’s post I will list the trades and the trade results for the week ending March 3rd, 2017. This week the statistics for this week are exceptionally good for the RYZE.Ai system from what I have observed so far. The performance shows that overall the trades were very positive and peoples brokerage accounts made significant increases this week. I list some of the detailed statistics below. This week there were 257 trades executed in the account. Of these 257 trades 57 were basically break-even trades, that is the overall result was effectively zero. Does this seem somewhat high? If you remember, the RYZE.Ai system spreads trades across many peoples individual accounts. So, for any given trade each account has just a tiny fraction of a trade lot. As a result, when the trade has a very small profit or loss and you spread that profit or loss across many individual accounts the net result can be less than one cent and thus shows up as zero. I would suppose that people with larger account balances would probably have far fewer of these zero trades than a smaller account because of rounding. Out of the 200 non zero trades, there were 123 winners and 77 losers, which means there are about 62% winning trades. What does this mean? It means that this week there were about 1.6 winning trades for every losing trade. The average winner was $0.65 and the average loser was $0.119. This means that the average winner is about 5 times the average loser. Overall, how did the account do this week, percentage wise? It was up 2.38%. This is one characteristic of the RYZE.Ai program that I really love, consistent profits. Also, there are a lot of trades and the exposure or risk to any one trade is very low as compared to an individuals account balance. 2.38% for the week is a fantastic return, which is the type account increase I will be happy with anytime. How does this weeks RYZE.Ai performance compare to the average performance? 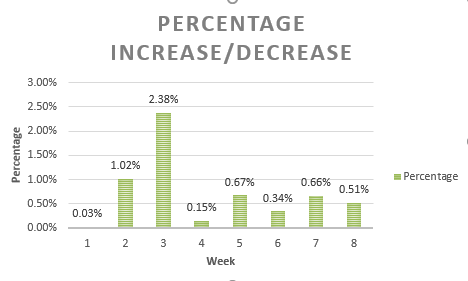 As you can see from the chart, I have tracked the RYZE.Ai performance for eight weeks up through April 7th and the weekly average was .72% per week. Compared to the average this weeks performance was fabulous. I prefer to have steady, consistent profits each week and watch my trading account constantly grow week after week, rather than see big fluctuations from week to week and month to month. There are other currency trading systems promise huge returns and promise 25% or 30% per month. The problem with these systems is that they never live up to their wild promises. Also, the risk is far, far higher and sooner or later (usually sooner) those programs have a few months of losses in a row and you lose half or all of your account. In comparison, RYZE.Ai is much different. It is not a get rich quick scheme. With RYZE.Ai the risk is far lower. For example, if RYZE.Ai had a few weeks of losing trades in a row (which has not happened yet, but it is possible in the future). If you look the average percentage variances in RYZE.Ai you would probably lose only a few percent, which could be recoverable in a few weeks. For myself, I would much rather have the slow and steady gains instead of larger more volatile fluctuations. Methodical and consistent, time and time again is what builds long term wealth. What did RYZE.Ai trade this week? 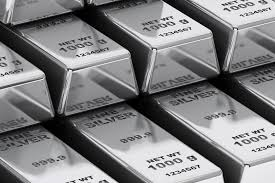 This week there were a lot of Swiss Franc trades and gold and silver trades which seems to be the case most weeks. In a recent post I already talked the history of the Swiss Franc, so today I will include some history and geography related to Switzerland itself. People who aren’t interested in this extra stuff can skip ahead to more about trading. For others, I hope you find it interesting. “The bent, almost banana-shaped Lake Zurich is framed on the southern side by the Albis and Zimmerberg hills and on the north by the Pfannenstiel chain of hills. The lake is bordered by the cantons of Zurich, St.Gallen and Schwyz. At the western end lies Zurich, Switzerland’s largest city. Whereas, in the past, the lake was above all a route for traffic and transport, today it is a popular place for excursions, and homes along its shores are much sought after. 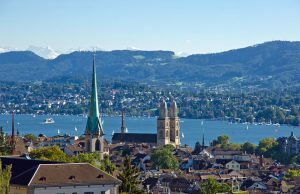 Gently rocking waves, peace and quiet, relaxation and fine food: the best way to discover the Lake Zurich area is by taking a boat trip. Most of the places around the shore are served by a regular boat service all year round. The undisputed favourites with the public are the two historic paddle-steamers. At the eastern end of the lake is the “rose town” of Rapperswil. In the public gardens here you’ll find over 15,000 rose bushes blooming, of more than 600 different varieties. The lakeside promenade with its Mediterranean charms, the picturesque Old Town and the medieval castle make this harbour town a popular place for excursions. For young visitors, Knie’s Children’s Zoo is high up on their wish-list. In summary, this was a fantastic trading week for the RYZE.Ai algorithm. Consistent, steady returns are what I am looking for and that is what RYZE.Ai provides. Excitement I can receive from my own personal trading account where I make small trades on my own, and I show for your entertainment in other articles. If you want to find out more about RYZE.Ai and Hodo Global please watch the videos here or click on the image above. There is also a Thursday evening webinar (USA and International Numbers available) that explains more details about RYZE.Ai. People can also email me with questions or leave a comment in the comments section below. People who are interested can send me an email to Xin@FXTradingIncome.com and set up a time to talk in person. If you are looking to subscribe to RYZE.Ai, click here. I hope you enjoyed this article. New articles will be posted every day. This entry was posted in RYZE.Ai Weekly Performance and tagged currency trading, FXTradingIncome, Hodo Global, how to trade currency, Ryze.ai, Xin Zhang on February 3, 2017 by Xin Zhang. I am grateful that you found a lot of great material in my article. I try to not just add the basic information but to add my own thoughts ir ecperiences to make it more relevant. If you have any specific questions or need more details, please do not hesitate to ask. Fantastic reporting and giving readers a breakdown and explanation for the weeks report for the RYZE.Ai performance. I can tell that you really know your stuff and I am glad that you choose to help others by giving them information. I am glad you found my article helpful. I try to post each weeks performance from the RYZE.Ai software program for currency trading by Hodo Global. The results over the months I have been tracking the RYZE.Ai program have been excellent. I have been very pleased so far. I do hope that others find the explanations and the performance data useful. It does take a long time to build the tables of all the trade data since there are several hundred trades in some weeks. As a result I still have a couple of months data to catch up on as far as posting goes. Trading is something I have been doing for a while on my own. However, I really like RYZE.Ai because it is a completely automated trading algorithm that trades for me when I don’t have the time. For many people without the time or desire to learn trading on their own it is a great solution to allow them to profit from currency trading. Please let me know if you have any questions or send me an email to Xin@FXTradingIncome.com and I will be happy to answer. Thanks for the clarity about what RYZE.Ai is. That has always been a puzzle to me. Hoping to learn more about the RYZE.Ai software, hopefully I will start using it for currency trading. Thanks. I am glad you would like to learn more about currency trading and to answer your question, how can I make money with RYZE.Ai? To learn more I would recommend that you start by attending the Thursday Evening Webinar which explains a lot about RYZE.Ai. The next step would be to send me an email to Xin@FXTradingIncome.com and set up a time to talk in person. That way I can answer any remaining questions you may have. Once you are ready click here and go to the subscription page. Once you are there choose the RYZE.Ai option. Again, if need be I can step you through the process on the phone. I look forward to speaking with you. I would like to know how to trade, you explained everything about the algorithms but I still don’t get how to use it. What are the requirements for one to get the algorithm? What is the basic amount to start trading from? I really the idea of like having and trading from the comfort of my house. RYZE.Ai is a trading system that is available as a subscription for Hodo Global members. The subscription price is variable depending upon the size of the account being traded. For example, a person with a $50,000 brokerage account would pay a higher subscription fee than a person with a $1,000 account. (Minimum account size is $500) To sign up for a subscription you first become a Hodo Global member. The link is here. Then from the list of options you choose RYZE and choose an initial account size. After the subscription is complete you will be able to open a brokerage account linked to RYZE.Ai and trading can begin in your account. I am going to write a full article on the sign up process soon and will respond with that link is well. In the meantime you can email me at Xin@fxtradingincome.com and set up a time where i can step you through the process on the phone. If you have any questions please let me know and I look forward to speaking with you in person.